Visitors to Soboba Casino need no convincing. Winners happen here, and those who frequent the casino see it every day. Occasionally they win big, really big. Statistically, those who play on high-limit machines win bigger payouts, but the real magic to winning big remains unknown and there are plenty of styles, theories, superstitions, or just strokes of sheer luck that may lead to hitting an enormous jackpot. 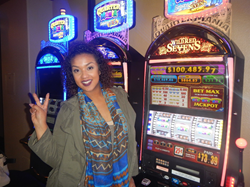 On February 6th, Amber J., a visitor of Soboba Casino took a seat at the “3 Quarter Mania Reel,” a 25 cent machine with a progressive jackpot, and a series of Wild Red Seven games. Jones placed a bet of $1.50 and sat patiently as the reels turned. After only seconds, a shining ‘Quarter Mania Emblem’ appeared on her first reel spin, moments later another, and finally in her third reel, a third Quarter Mania emblem appeared! Amber struck a jackpot totaling $165,987.18 on only a $1.50 bet! Soboba Casino locals have seen their fair share of big winners on all different denominations of slots with progressive payouts. Progressive jackpots grow slowly but surely, with multiple machines all competing for the big win. Although the payout is not frequent, when it does happen, it can be a huge win. It isn't all about pouring your cash into a slot machine and hoping the algorithms calculate in your favor. Huge money can be won on a single $1.50 bet, and Amber is the proof. According to Joe Whitman, Director of Slots at Soboba Casino, “Over the course of recent months, we have been making a lot of changes.